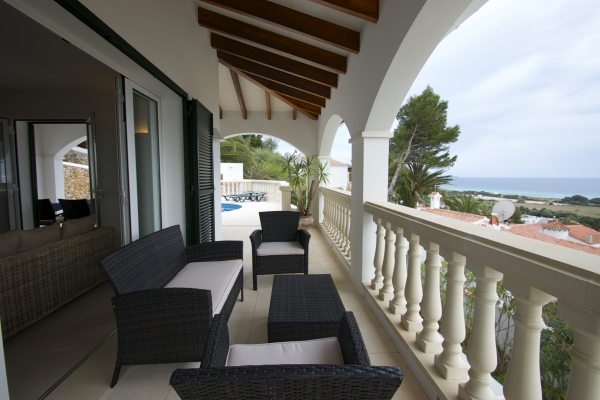 Nestled on the hillside in the resort of Son Bou is our latest addition to our Menorca programme, Villa Bellamirada. 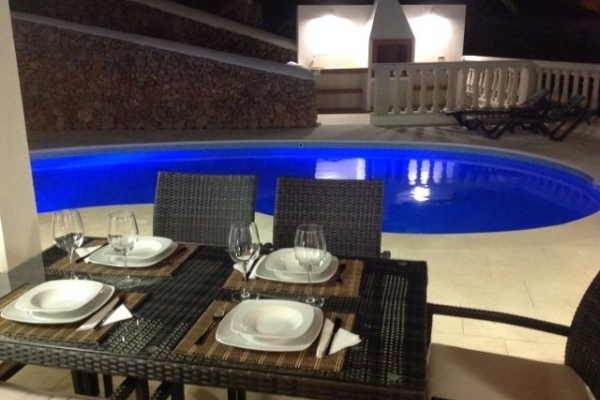 This modern and tastefully decorated villa offers spectacular panoramic views of the longest beach on the island. Entrance to the villa from the street is by a long ramp making this villa perfect for wheelchairs access. 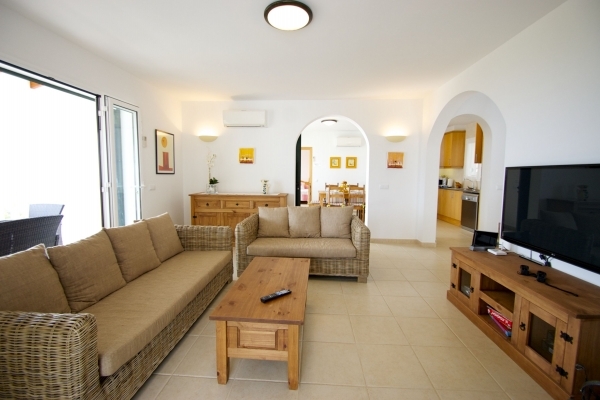 On entering the villa you get an immediate feeling of peace and relaxation. 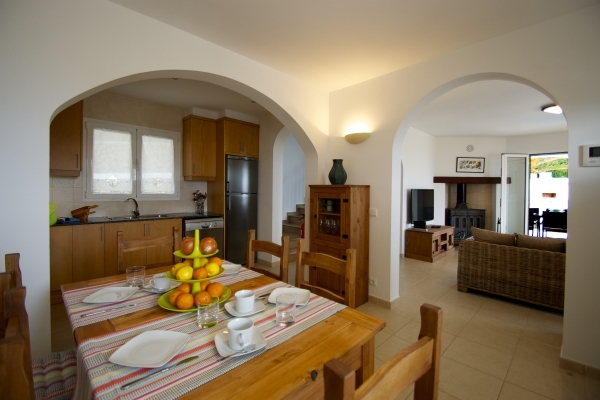 The open plan lounge / dining area and modern kitchen comes well equipped with all mod cons. On this level to the left is a twin bedroom with en-suite shower suitable for wheelchair access. Stairs lead up to the first floor where you will find the remaining two bedrooms. The master double bedroom boasts en-suite shower and has it's own large terrace, where you can relax and absorb those amazing views. 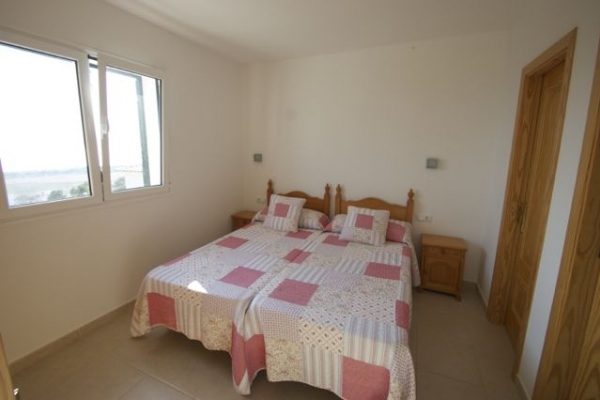 Finally there is a twin bedroom with en-suite bathroom and also benefits from its own small terrace. Leading directly from the lounge, a spacious covered terrace with a 7 metre kidney shaped pool has three roman steps into a shallow end and also has a special feature which illuminates the pool at night with colour changing lights. To the other side of the pool is a brick built BBQ and an outside shower. Another covered terrace along the front of the house offers a great place to relax and take in the night views over this popular South coast resort. 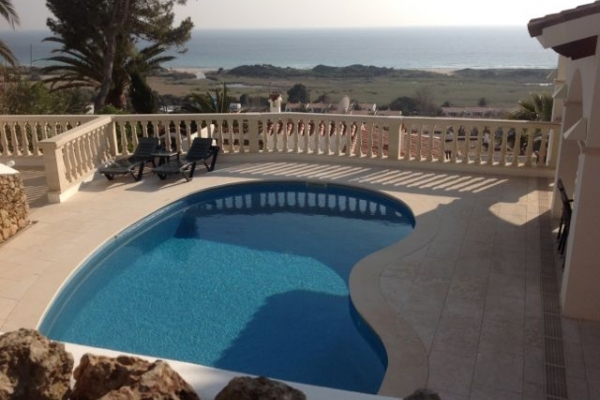 This spectacular villa is ideal for a relaxing and peaceful holiday yet within walking distance of all that the resort of Son Bou has to offer with its long sandy beach, an array of shops, restaurants and bars and a bowling alley. N.B Although the villa has disabled access the villa is situated high on a hillside therefore the walk back to the villa from the resort is quite steep. Beach towels, beach parasol and a beach bag.